Peel peaches and slice into 1/4 inch slices. To peel peaches quickly bring a large pot of water to a full boil, add peaches and boil for 1 - 2 minutes. Remove from water with a slotted spoon into strainer and run cold water over them. Remove skin with paring knife. 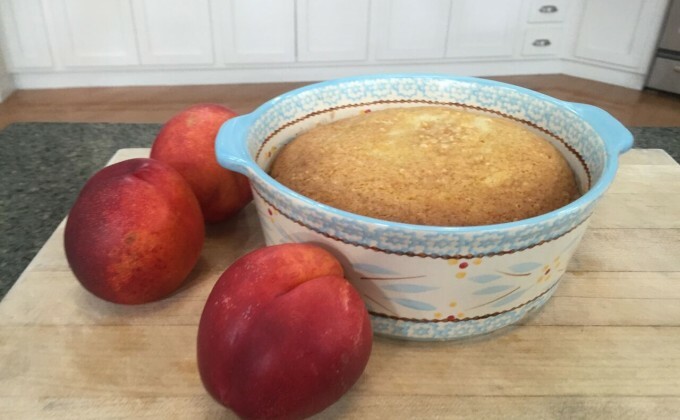 Toss sliced peaches with cinnamon and 1/4 cup of sugar and place in cake pan. Set aside. Cream butter, 1 cup of sugar and salt in the bowl of a stand mixer. Blend in egg and vanilla until light & fluffy. Place flour and baking powder in a small bowl. Stir with a fork and set aside. On low speed blend in 1/3 of the flour mixture followed by half of the milk. Continue alternating the flour mixture and milk until everything is used. Spread batter on top of peaches and bake for 35 - 45 minutes or until a toothpick inserted into the center comes out clean.